In the United States, nearly 1 in 5 school-age children and young people (ages 6 to 19) has obesity, according to the Centers for Disease Control and Prevention. Childhood obesity is a national epidemic, and Type 2 diabetes, high cholesterol and cardiovascular risks are attacking children at a young age, largely due to their poor diet and lack of exercise. The most important way to keep children healthy is to have their parents involved in their health and wellness. From what our kids are fed to how much they play, we are the cornerstone in the fight against childhood obesity. Some children naturally love being outdoors and in nature, while others need a little encouragement to test their boundaries. All kids deserve to be healthy, so whether your little one likes indoor play or can't be dragged in from the backyard, it's good to keep them moving. Play experts agree that educators, parents and caregivers should be doing everything in their power to facilitate at least 60 minutes of play a day. A new school year can shake up their summer routine, and after-school activities are a great way to make sure each child receives the play time they need to keep their bodies and minds strong. Dr. Christopher Ledingham, an assistant professor in the Recreation, Education, and Kinesiology Center at the University of Texas at Brownsville, believes that the best after-school activities "are those that not only get children moving, but also serve to educate them on the importance of lifelong physical activity. Of course, all this has to be done under the premise of keeping it fun!" Use one of the following activities to increase your child's exercise levels, and get involved yourself! After-school sports abound in the fall and spring, so if possible, get your children involved in one or two of the sports they enjoy most per season. Involving your kids in after-school activities builds their self-confidence, fosters leadership skills and gives them the ability to work as a team player. (Just make sure you're not sacrificing homework time!) Through schools or local organizations like the YMCA or Boys & Girls Clubs of America, kids can enjoy everything from baseball and volleyball to youth boot camp and fitness classes. JC Lopez, membership and wellness director of the North Pointe YMCA Family Center in Miami, Florida, says his center offers "healthy programs that keep children physically and mentally active after school." Discuss possibilities with your child in order to find a good fit. Sometimes kids really aren't into organized team sports — and that is perfectly OK. If after-school sports are not in the cards for your kids (or if they're too young or not interested), then make your own backyard games! When school is over, take the time to throw a ball, organize mini races in the backyard or up and down the street or set up a simple obstacle course in your yard and see how fast each of your children can get through it. Most kids thrive on a little competition, and if it gets them moving, even better. If your little guy or girl is more interested in solo activities that don't necessarily involve teams, he or she may take a liking to martial arts. 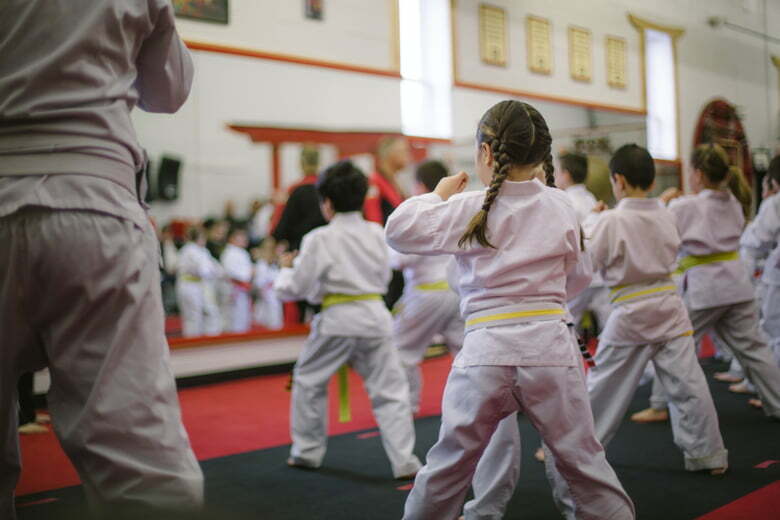 Karate, judo and tae kwon do are great for kids of varying ages and abilities and cultivate self-discipline, self-confidence and a sense of respect for themselves and others. And if that weren't enough, the kids get a heck of a workout while participating, too! Classes are usually an hour long and begin with warmups like jumping jacks and stretches, then move on to really challenge the kids' cardiovascular systems to keep their blood pumping and their bodies active. Turn off the TV, turn on the radio and throw a kid-sized dance party. Play music while you cook dinner and watch as your kids move and shake. Encourage them to use their whole body to dance; kids will love jumping, kicking their legs and swinging their arms while moving to their favorite songs. Who knows? You may be inspired to join in and push dinner back a little! Yoga isn't just for adults. It can be very beneficial for kids, as well. It has been shown to improve stress, breathing, flexibility and discipline. And it's lots of fun! Look in your area for after-school yoga classes aimed at kids. Lots of schools offer them and there are also tons of DVDs available that will show your child how to Downward Dog like a pro. No one like doing chores, but by adding a little music and movement, they become much more fun. You'll be exercising your body without realizing it. Think of creative ways your kids can incorporate movement into their regular after school chores. For example, if they help you sort socks, pile the socks at one end of the room and leave the laundry basket at the other end. Whenever they find a match, they have to do a little leg work. If you have several children sorting, assign each a laundry basket and race to see who can fill it up the fastest. Exercise is almost always more fun with a friend. After school can be a great time to do something simple like take a walk, it's free and doesn't require any membership fees. Schedule a walking date with other families in the neighborhood; kids can even ride along on their bikes. You can travel casually down streets you might zip down while driving, looking at birds, counting the numbers of windows you see or even just playing games like I Spy. Commit to once a week for half an hour to start, and see how often and how long you can work up to. Help older kids set up a business that involves movement. For example, they can walk your friend's dog in the afternoons, weed neighbors' gardens or clean a senior person's house. These are great first jobs for kids; they can learn about responsibility, make a little spending money and get some heart-pumping exercise in as well. Think of all the errands you do each week. Is there any way that you and your kids can incorporate walking or running into them? Adding a walk to the store and carrying (or pulling) those groceries home is a great addition to a weekly workout and one your kids can participate in. In addition to meeting an exercise goal, you're also doing your part for the environment by driving less. While you're getting your kids to focus on exercise and move more, don't forget about yourself! Kids often mirror the actions of their parents; if you're a couch potato, your children may not have a good example to follow. Dr. Timothy Church, director of the Laboratory of Preventive Medicine in Baton Rouge, Louisiana, researches the benefits of exercise and knows that "we need physically active families; not just active kids," to make an impact. Make exercise a goal for everyone in the family. Set up a chart on the fridge and when a family member does something physically active, they get a star. The person with the most stars at the end of the week gets a prize, like picking a film for movie night or getting out of a chore. Remember to keep the after-school activities fun and age appropriate to encourage the most participation. A little exercise goes a long way — squeeze in 30-60 minutes here and there and your kids will not only be healthier for life, they'll be happier, too! Marissa Burke is a happily adventurous wife, mother and runner. Living in Lakewood, Ohio she searches neighboring communities for exciting food and drinks that are good and good for you on the Cleveland area.